“Something is not right here”, says Valeros, looking around the marketplace. His hand moves to the hilt of his sword. Merisiel taps his arm twice and vanishes into the crowd. Turning, Valeros glances at the half-elven siblings. Lirianne and Seltyiel are a short distance away, heads together, whispering to each other. Valeros waves briefly to them. They nod, separate, and begin to survey the square. The mood in the marketplace has subtlely changed. The volume of chatter is lower and the haggling merchants are less animated. Valeros shifts his position to place his back to a wall. A faint blue light glistens around Seltyiel’s hands. Lirianne slowly pulls back the hammers of her flintlocks. There is a clear audible click. For an moment, like a lull in a storm, a quiet falls over the square. Everyone seems to be holding their breath. Merisiel appears at Valeros’s side. She is wiping a dagger on her thigh. Posted in Blog Posts and tagged PACG, Pathfinder Adventure Card Game, session report, Skull & Shackles on December 13, 2014 by Tim. Seltyiel raises his hands and takes a slow step backwards. The rapier point follows his movement, inches from his throat. The alleyway is dark. Moonlight shines on the roof tiles, but shadows hide the features of the ruffian brandishing the sword. Three more sinister shapes sidle out of doorways and three more blades glint in the darkness. Seltyiel flexes his fingers slightly. 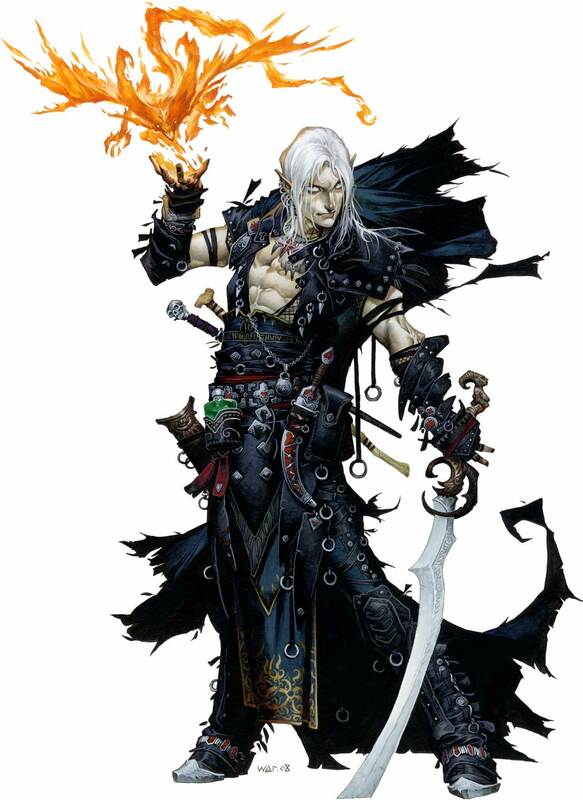 Faerie-fire flickers on his fingertips as he watches the sword-points advance towards him. His back presses against the rough wall and he prepares to strike. Suddenly four sharp cracks echo around the alley. The bitter smell of gunpowder fills the air. Four bodies slump to the ground. Lirianne drops lightly to the cobblestones and holsters her flintlocks. Lirianne hooks her arm around his neck and rubs her knuckles into his scalp. Posted in Blog Posts and tagged PACG, Pathfinder Adventure Card Game, session report, Skull & Shackles on September 28, 2014 by Tim. I got the Heirs of Numenor deluxe expansion for the Lord of the Rings Card Game. This is one of the big-box expansions and is the second of the deluxe expansions, after Khazad-Dum. This one concentrates on the warriors of Gondor, down in the city of Minas Tirith. Posted in Blog Posts and tagged Expansion, lcg, LOTR LCG, session report, The Lord of the Rings Card Game, Unboxing on August 14, 2014 by Tim. The Elf-Lord Glorfindel stands gazing south along the river. His golden hair blows slightly in the breeze and his eyes are bright and distant. The Anduin weaves, broad and slow, between the banks that separate the borders of Mirkwood from the foothills of the Misty Mountains. The Company has escaped from Mirkwood, but the journey to Lorien will take them along its borders and within the territory of the goblins that lurk in the hills. Glorfindel turns his head and watches the twin Elf-princes Elladan and Elrohir stride up the bank to where he awaits at the forest edge. Their ranger cloaks are damp and weariness shows on their faces. “We have been several leagues up and down the river,” says Elladan. “There are Orc tracks and trails of Wargs,” says Elrohir. “Also one large footprint, and a set of smaller prints, ones we did not recognise,” adds Elladan. “We saw no marks of spiders,” finishes Elrohir. Posted in Blog Posts and tagged lcg, LOTR LCG, session report, The Lord of the Rings Card Game on August 12, 2014 by Tim. My new Lord of the Rings Card Game deck with the three Elves smashed some serious spider face. The little Fellowship has been tasked with couriering a message from the King of the Wood Elves to Lady Galadriel far south in Lorien. (Lady Galadriel was Cate Blanchett in the movies). The first stage of the journey is through the gloomy forest of Mirkwood. A previous group of messengers had left some days earlier and had never been heard from again. As the three Elf Lords, Elrohir, Elladan and Glorfindel, lead the band down the Old Forest Road and the gnarled trees begin to loom over their heads, they can hear rustling among the foliage. One of the spearmen curses as his pike becomes entangled in a web spread high above the path. Elladan glances at his twin brother Elrohir and silently draws his sword. Glorfindel signals to the rest of the company and they fall into a defensive formation. There is silence. Water drips onto moss. Metal scrapes on metal as someone shifts their stance. The eerie silence continues. Glorfindel, listening, raises his hand to give the sign to continue. 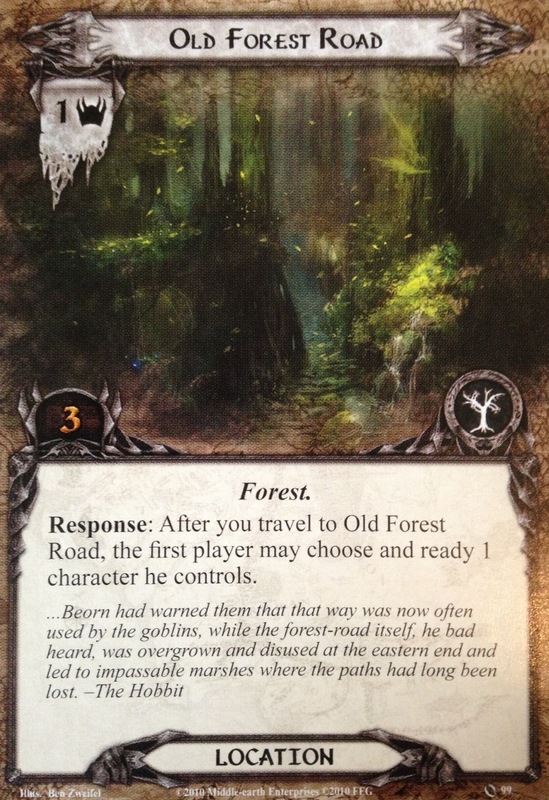 Posted in Blog Posts and tagged lcg, LOTR LCG, session report, The Lord of the Rings Card Game on August 8, 2014 by Tim.